MARLBOROUGH, Mass.--(BUSINESS WIRE)--Sunovion Pharmaceuticals Inc. (Sunovion) today announced that the U.S. Food and Drug Administration (FDA) approved the New Drug Application (NDA) for Lonhala™ Magnair™ (glycopyrrolate) Inhalation Solution (25 mcg twice daily), also known as SUN-101/eFlow®, for the long-term, maintenance treatment of airflow obstruction in people with chronic obstructive pulmonary disease (COPD), including chronic bronchitis and/or emphysema. Sunovion expects LONHALA MAGNAIR to be available in U.S. pharmacies in early 2018. LONHALA MAGNAIR is the first nebulized long-acting muscarinic antagonist (LAMA) approved for the treatment of COPD in the U.S. and the first use of the MAGNAIR, which is based on the closed eFlow® technology system, developed by PARI Pharma GmbH, to treat COPD. This technology is a virtually silent, portable, closed system nebulizer that is designed to deliver the drug in two to three minutes and allows people to breathe normally while using the device. Approximately 15.7 million adults in the U.S. report they have been diagnosed with COPD, a common, preventable and treatable disease that is characterized by persistent respiratory symptoms and airflow limitation that is due to airway and/or lung abnormalities usually caused by significant exposure to toxic particles or gases.1,2 The main risk factor for COPD is tobacco smoking, but other environmental exposures may contribute.2 The disease makes it hard for people to breathe and subsequently may limit their ability to perform some routine activities, including the proper inhalation of medication.2 This improper medication technique may impact treatment over time and may also result in an inadequate amount of the drug reaching the lungs, potentially worsening a person’s COPD.3,4,5 For people with moderate-to-very-severe COPD, nebulized treatments offer an alternative to inhalers, allowing a person to breathe normally while taking their medicine. The approval is based on data from the clinical trials in the Glycopyrrolate for Obstructive Lung Disease via Electronic Nebulizer (GOLDEN) program, which included GOLDEN-3 and GOLDEN-4, two Phase 3, 12-week, randomized, double-blind, placebo-controlled, parallel-group, multicenter, efficacy and safety trials comparing LONHALA MAGNAIR with placebo in adults with moderate-to-very-severe COPD. At study endpoints, individuals treated with LONHALA MAGNAIR demonstrated statistically significant and clinically important changes from baseline in trough forced expiratory volume in one second (FEV1) at Week 12 versus placebo. An additional study, GOLDEN-5, was a Phase 3, 48-week, randomized, open-label, active-controlled, parallel-group, multicenter safety trial designed to evaluate the long-term safety and tolerability of LONHALA MAGNAIR in adults with moderate-to-very-severe COPD and included the active comparator Spiriva® (tiotropium bromide) delivered by the HandiHaler® device. LONHALA MAGNAIR was generally well-tolerated in clinical studies, with the most common side effects being exacerbations and cough. The overall treatment emergent adverse events (TEAE) incidences were similar for glycopyrrolate and tiotropium groups over 48 weeks. Anyone seeking medical information, patient assistance and other information about LONHALA MAGNAIR can access Sunovion Answers by calling 1-844-276-8262 Monday through Friday from 8:00 a.m. to 8:00 p.m. ET. LONHALA MAGNAIR (glycopyrrolate) Inhalation Solution, also known as SUN-101/eFlow®, is the first long-acting muscarinic antagonist (LAMA) bronchodilator delivered via the MAGNAIR, which is based on the closed eFlow® technology system, developed by PARI Pharma GmbH. 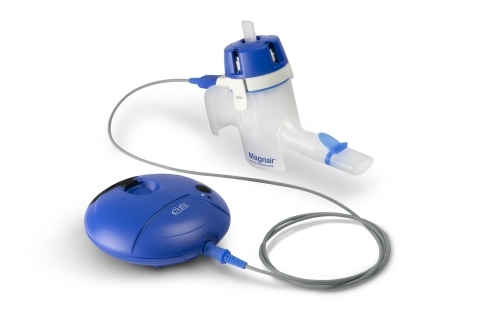 The MAGNAIR nebulizer is a virtually silent, portable delivery device that reduces the amount of time required to deliver the drug to two to three minutes and allows people to breathe normally while using the device. LONHALA MAGNAIR is approved for the long-term, maintenance treatment of airflow obstruction in people with chronic obstructive pulmonary disease (COPD), including chronic bronchitis and/or emphysema. LONHALA™ MAGNAIR™ (glycopyrrolate) is a medicine called an anticholinergic. LONHALA MAGNAIR is used long term, twice each day (morning and evening), for maintenance treatment of chronic obstructive pulmonary disease (COPD), including chronic bronchitis and/or emphysema. LONHALA MAGNAIR does not relieve sudden symptoms of COPD and should not be used more than twice daily. Always have a short-acting beta2-agonist with you to treat sudden symptoms. Do not use LONHALA MAGNAIR unless your health care provider has taught you how to use the device and you understand how to use it correctly. Use LONHALA MAGNAIR exactly as your health care provider tells you to use it. Do not use LONHALA MAGNAIR more often than is prescribed for you. Do not stop using LONHALA MAGNAIR or other medicines to control or treat your COPD unless told to do so by your health care provider because your symptoms might get worse. Your health care provider will change your medicines as needed. Do not use LONHALA MAGNAIR if you are allergic to glycopyrrolate or to any of the ingredients in LONHALA MAGNAIR. Ask your health care provider if you are not sure. Tell your health care provider about all the medicines you take, including prescription medicines, over-the-counter medicines, vitamins, and herbal supplements. LONHALA MAGNAIR and certain other medicines may interact with each other. This may cause serious side effects. Common side effects of LONHALA MAGNAIR include shortness of breath and urinary tract infection. These are not all of the possible side effects with LONHALA MAGNAIR. Tell your health care provider about any side effect that bothers you or that does not go away. For additional information, please see full Prescribing Information and Patient Information for LONHALA MAGNAIR at www.LonhalaMagnair.com. A long-acting muscarinic antagonist (LAMA) is a type of long-acting bronchodilator, along with long-acting beta2-agonists (LABAs). According to the GOLD 2017 report, these are currently the first-line standard of care maintenance therapy for symptomatic individuals with COPD, and help the muscles around the airways in lungs stay relaxed to prevent symptoms such as wheezing, coughing, chest tightness and shortness of breath.2,6 LAMAs are widely used and an important therapeutic approach for people with COPD. GOLDEN-3 and GOLDEN-4 were pivotal Phase 3, 12-week, randomized, double-blind, placebo-controlled, parallel-group, multicenter, efficacy and safety trials comparing LONHALA MAGNAIR with placebo in adults with moderate-to-very-severe COPD. The GOLDEN-3 trial enrolled 653 people who were at least 40 years old at 45 sites in the United States. The GOLDEN-4 trial enrolled 641 people who were at least 40 years old at 49 sites in the United States. LONHALA MAGNAIR 25 mcg, LONHALA MAGNAIR 50 mcg or placebo was administered twice daily in these studies. The primary endpoint was the change from baseline in trough FEV1 at Week 12. Key secondary endpoints included standardized change from baseline at Week 12 in FEV1 area under the curve (AUC), change from baseline in trough forced vital capacity (FVC) at Week 12, change from baseline in health status measured by St. George’s Respiratory Questionnaire (SGRQ) and change in rescue medication use. Safety was assessed by the number of treatment emergent adverse events (TEAE), serious adverse events (SAE) or major adverse cardiac events (MACE) and the number and percentage of study participants who discontinued due to TEAEs. Both GOLDEN-3 and GOLDEN-4 studies included not only people who were taking effective background long-acting bronchodilator therapy but also individuals with very severe disease and co-existing cardiovascular illness. Approximately 10 percent of the population were elderly (>75 years), 65 percent were classified as being high-risk cardiovascular individuals and approximately 30 percent were taking long-acting bronchodilator therapy [NCT02347761 and NCT02347774]. GOLDEN-5 was a Phase 3, 48-week, randomized, open-label, active-controlled, parallel-group, multicenter safety trial designed to evaluate the long-term safety and tolerability of LONHALA MAGNAIR in adults with moderate-to-very-severe COPD. The study enrolled 1,087 individuals at 111 investigational sites in the United States and Europe. The study evaluated 50 mcg of LONHALA MAGNAIR delivered twice-daily and active comparator 18 mcg of Spiriva® (tiotropium bromide) delivered once-daily by the HandiHaler® device. The primary safety endpoints were: the number and percentage of study participants with TEAEs, the number and percentage of study participants with treatment emergent SAEs, the number and percentage of study participants who discontinued due to TEAEs. Secondary endpoints included the mean change from baseline over 48 weeks in trough FEV1 for all subjects and the number and incidence of subjects with MACE. The study included not only people who were taking effective background long-acting bronchodilator therapy but also individuals with very severe disease and co-existing significant cardiovascular illness. Approximately 10 percent of the population were elderly (>75 years), 65 percent were classified as being high-risk cardiovascular individuals and more than 40 percent were taking long-acting bronchodilator therapy [NCT02276222]. Sunovion is a global biopharmaceutical company focused on the innovative application of science and medicine to help people with serious medical conditions. Sunovion’s vision is to lead the way to a healthier world. The company’s spirit of innovation is driven by the conviction that scientific excellence paired with meaningful advocacy and relevant education can improve lives. With patients at the center of everything it does, Sunovion has charted new paths to life-transforming treatments that reflect ongoing investments in research and development and an unwavering commitment to support people with psychiatric, neurological and respiratory conditions. Sunovion’s track record of discovery, development and/or commercialization of important therapies has included Lonhala™ Magnair™ (glycopyrrolate) Inhalation Solution, Utibron™ Neohaler® (indacaterol/glycopyrrolate) Inhalation Powder, Seebri™ Neohaler® (glycopyrrolate) Inhalation Powder, Arcapta Neohaler (indacaterol) Inhalation Powder, Brovana® (arformoterol tartrate) Inhalation Solution, Latuda® (lurasidone HCI) and Aptiom® (eslicarbazepine acetate). 1 MMWR: Morbidity and Mortality Weekly Report. Employment and Activity Limitations Among Adults with Chronic Obstructive Pulmonary Disease — United States, 2013. March 27, 2015; 64(11). Available at http://www.cdc.gov/mmwr/. 2 GOLD Guidelines 2017. http://www.goldcopd.org/guidelines-global-strategy-for-diagnosis-management.html. Accessed: March 16, 2017. 3 Singh S, Loke YK. An overview of the benefits and drawbacks of inhaled corticosteroids in chronic obstructive pulmonary disease. International Journal of Chronic Obstructive Pulmonary Disease. 2010;5:189-195. 4 Restrepo RD, Alvarez MT, Wittnebel LD, et al. Medication adherence issues in patients treated for COPD. International Journal of Chronic Obstructive Pulmonary Disease. 2008;3(3):371-384. 5 Taffet GE, Donohue JF, Altman PR. Considerations for managing chronic obstructive pulmonary disease in the elderly. Clinical Interventions in Aging. 2014;9:23-30. doi:10.2147/CIA.S52999. 6 National Heart, Lung and Blood Institute. (2013). “What Are the Signs and Symptoms of COPD?” Retrieved from https://www.nhlbi.nih.gov/health/health-topics/topics/copd/signs. 7 National Heart, Lung, and Blood Institute. “What is COPD?” Available at: http://www.nhlbi.nih.gov/health/educational/copd/what-is-copd/index.htm. Accessed: March 2, 2016. 8 Partridge MR, Karlsson N, Small IR. Patient insight into the impact of chronic obstructive pulmonary disease in the morning: an internet survey. Curr Med Res Opin. 2009;25:2043–8. 9 Roche N, Small M, Broomfield S, Higgins V, Pollard R. Real world COPD: association of morning symptoms with clinical and patient reported outcomes. COPD. 2013;10:679–86. 10 Agusti A, Hedner J, Marin JM, Barbé F, Cazzola M, Rennard S. Night-time symptoms: a forgotten dimension of COPD. Eur Respir Rev. 2011;20:183–94. Sunovion announces that the FDA approved Lonhala™ Magnair™ (glycopyrrolate) Inhalation Solution to treat COPD.